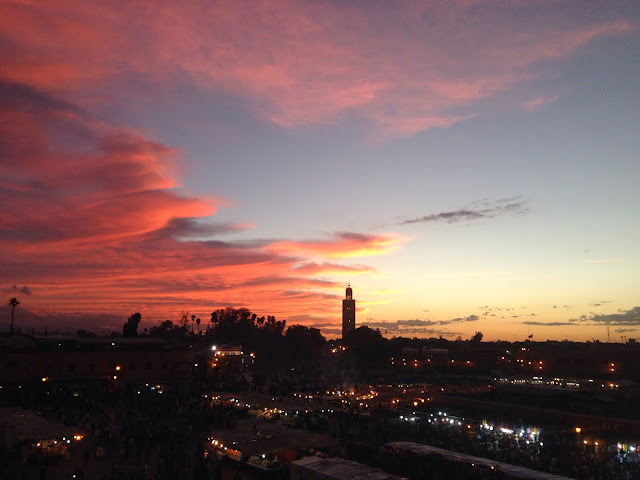 Marrakesh! We arrived late after a long train ride from Fez (7 hours anticipated, 9 hours actual with delays). It was grueling, but bearable due to amazing views of the countryside and the nice young Moroccan people in our train car during the latter part of the trip. One was a flight attendant for RyanAir, another was planning a trip to Florida, and another was, as he described himself, "an international man of travel running [his] own small businesses looking for the 'perfect woman', but willing to settle for around 60%-70%". It was a fun mix of languages and cultures; one person could only speak Arabic and French, another, only English and Arabic. I myself can only speak English and French, but we managed to have quite the lively convo. At one point, the bon vivant international man of mystery joked about how he needed to charge his phone, but he didn't feel like going to the bathroom (randomly, the only outlets available were in the train's bathrooms). I offered to let him use my portable charger. He chided me for not revealing earlier that I had one, stating "You heard me complaining all this time, and you didn't say a word! ", until one of the girls reminded him that he had been complaining in Arabic. 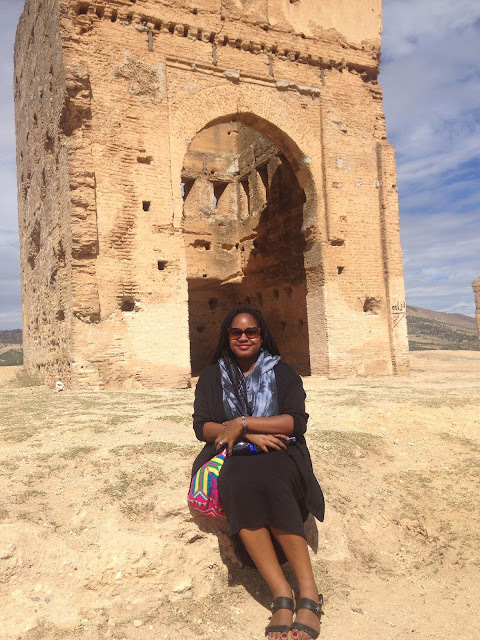 Like many of the people I met in Morocco, they loved that my name was Azeezah (Arabic/Farsi="dear" and/or "precious"). The dude said I was "'Azeezah' indeed" when I offered to let him use my charger lol. Our riad in Marrakesh was awesome. It had a cute little plunge pool and a nice roof for morning yoga. There were also unofficial riad mascots that lived on the roof full-time (aka turtles). My buddy Omar (that's what I named him). Marrakesh was completely different from Fez. I was surprised at how dissimilar they were, although I had no reason to believe that they would be similar in the first place. Fez was a whitish/greyish color, with green tile accents on the minarets. The pathways in the medina were dark and narrow, but led you to hidden gems. There was a general air of both history and mystery. Marrakesh was orangey/red (some call it "the pink city") and the roads were jammed with an assortment of pedestrians, cars, and motorbikes. The main square at the heart of the medina–Jemaa-el-Fnaa–was wide open and hosted an assortment of stalls, dancers and snake dudes that would throw their snake over your shoulders and demand dirham for a photo if you weren't careful. Fez was subdued beauty; Marrakesh was a riot of color and sound. Stall of dried fruit, guy waving underneath. View of the medina from Place Jemaa-el-Fna. Our first full day we went to Jardin Majorelle, a beautiful, sleek garden full of succulents, palms, and other desert flora, established by none other than the late Yves Saint Laurent himself. The manicured grounds also housed a café, a gift shop, and a not-to-be-missed museum of Berber culture. The museum didn't allow photographs, which is probably a good thing since I'd still be there snapping away! The berber jewelry in particular was exquisite. The old Majorelle house and all of the accents in the garden were painted a gorgeous cornflower blue. I finally got a tangine-cooked meal at Le Jardin. It was yummalicious. 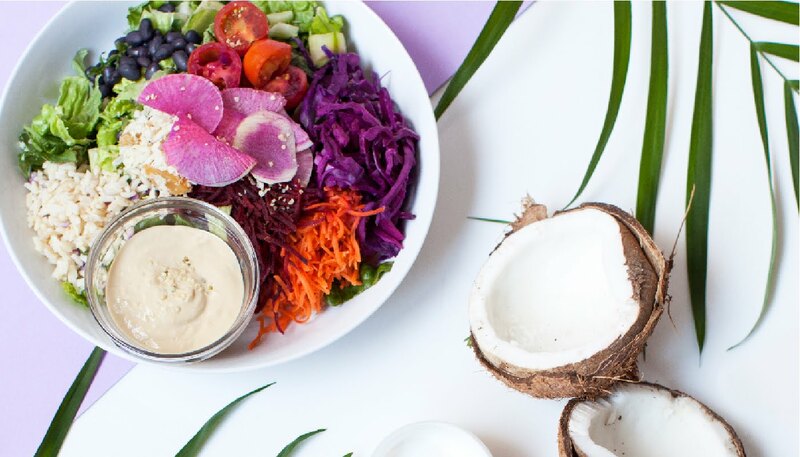 We were told that the couscous in Morocco has different seasoning than in other parts of the world, so it's a must-try for couscous fans. 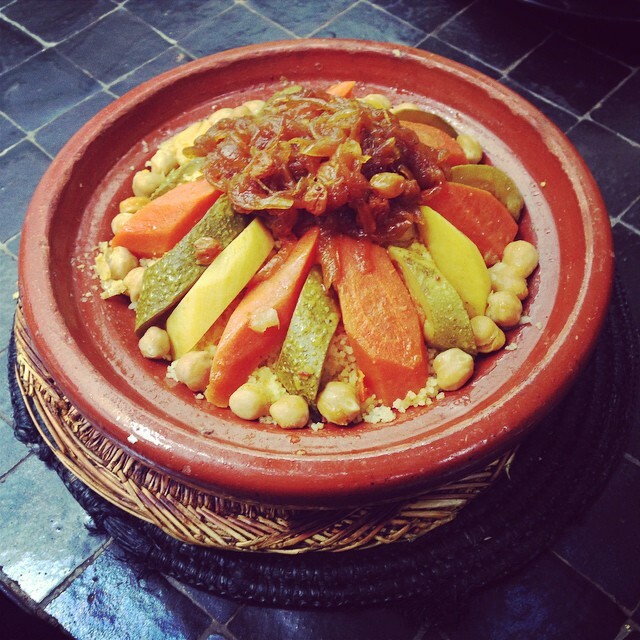 Vegetarian couscous topped with veggies, caramelized onion and golden raisins. We visited Douiria de Mouassine as well, but my phone lost all the pics :/ It was a nice visit, and there were pomegranate trees in the garden. On the last day, we visited a private hamamm near our riad. It was super nice, and I highly recommend it to anyone visiting Marrakesh (also, it will be necessary after avoiding being hit by motorbikes all day). For a trip I planned myself (no tourist packages here, baby! ), I must say it went really well! Morocco is an affordable, world-class destination and I highly recommend it to Parisians (and wannabes) looking for a great vacation, as well as anyone else! My "travel style" is such that when I have the opportunity, I like to really delve into a new country as much as possible during a visit. I try to learn local customs, pick up a bit of the language, research foods, et cetera. To really get a good "feel" for a place, I like to try and stay a bit longer than just a day or two. That's why when longer school breaks roll around, such as fall break, it's fun to use the extra time to really do some exciting, exploratory travel. It's cheap. Being a student on a budget, cheap is key. 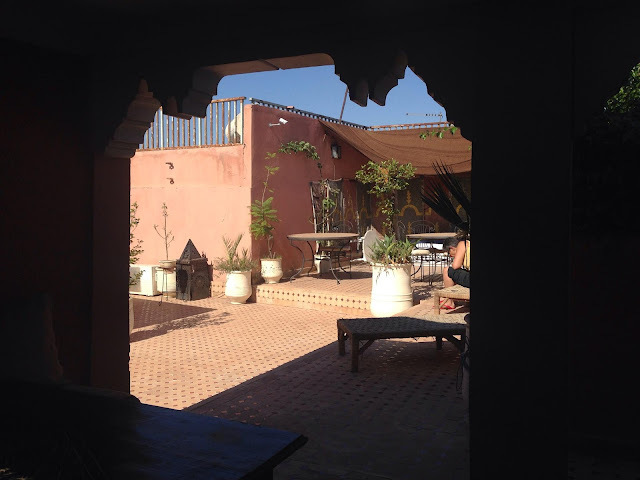 We were able to stay in riads (Moroccan guest houses/boutique hotels) for only around 20-30 euro a night. The food was reasonably priced, and you can get amazing gifts in the souks for a steal (if you're willing to haggle). It's convenient. I've been looking at flights in March to Marrakech (you can tell I liked it) and have found some out of Charles De Gaulle direct to Marrakesh for under 100 euro. The flight itself is less than 3 hours. Although I don't know much Arabic or any of the Berber languages, I do know French, which turned out to be key for getting around in Morocco (many moroccans speak french as a second language). It's beautiful. I can't tell you how amazing it was to see the gorgeous fountains, the mosques, the minarets, the gardens... I could go on and on. The same high quality of work and attention to detail is also found in the goods available for sale in the markets. The landscape itself is also very beautiful. The snowcapped Atlas Mountains served as a wonderful backdrop in Marrakesh, and the train ride from Fez was a great opportunity to see the rolling, olive tree-covered hills of the countryside. It's different. STUDYING in Europe, doesn't mean STAYING in Europe. Europe is great and all, but if you can expose yourself to diverse, rich cultures just a few miles away, why not? As you can see, it was an easy choice. So much awesomeness deserves two posts, and since I'm on fall break, imma treat y'all. I'll be splitting up the posts by city: this one will be the Fez post, and the next will be the Marrakesh post. Check out this article for a quick primer on some of the differences between the two cities. So throw on your comfiest, sparkliest abaya, sit back and let's go...to Morocco! Luckily, I had the excellent fortune of befriending a classmate that had lived in Fez for 2 years with the Peace Corp the night before I went to Morocco. We went for drinks after our Friday class and he gave me some great tips, as well as information about some of the work he still does in Morocco for Human Rights Watch. One of the best tips he gave me was to watch out for "false guides"; guys on the street that will tell you something is closed so that they can "guide" you somewhere else, and then demand payment. He also told me that I had to visit Cafe Clock in Fez. Both of these pieces of information turned out to be solid tips, indeed. We left Paris on Saturday afternoon and took a pretty long bus ride out to the Beauvais airport. Our flight was a direct one, but bad weather in Fez meant that our plane was forced to land in the capital city of Rabat. The 30 or so minutes it took for us to find out we were going to wait out the rain and fly back to Fes were pretty stressful, to say the least. Luckily, after a short delay we were back in the air and soon after we landed in Fes. The driver our riad sent for us was waiting at the airport with a sign with my name on it. We checked in late that night, but out of one of the windows I saw buildings situated on lightly undulating hills in a sort of valley, with yellow electric lights illuminating certain patches and throwing others into relief. Very beautiful. The next day was our only full day in Fes, so we decided to use it to tackle the medina. Our awesome concierge, Aziz, arranged a guide for us. All of the websites we checked said that finding one's way through the Fes medina without a guide is near-impossible. The word "labyrinthine" popped up on more than a few travel sites, shall we say. Had we had more time, I would have suggested that we go it alone, but we thought having a guide would be the best bet for getting the most out of our limited time in the city. While we waited for our guide to arrive, we decided to go check out a gate to the medina that was right next to the alleyway in which our riad was located. We crossed a large courtyard and then entered a narrow walkway which lead us onto streets lined with shops: the medina proper. At every turn, we heard shouts warning us of donkeys coming down the street next to us. The streets are too narrow for motorized vehicles, but handcarts and donkeys are constantly going to and fro on the narrow streets. Although foreign women are not required to do so, I decided to cover my hair in order to show respect and to remain as incognito as possible. 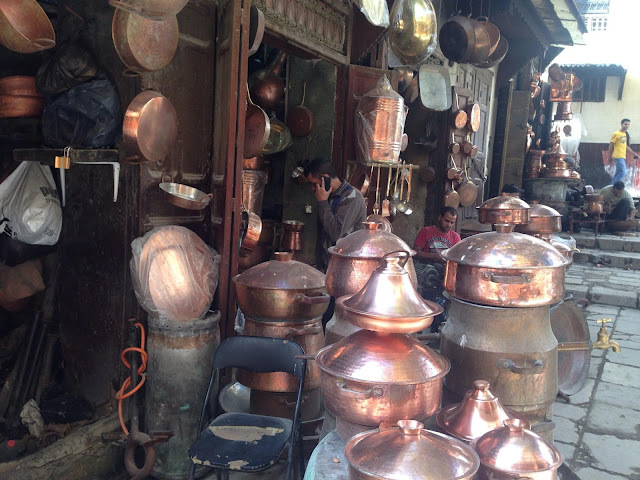 We didn't have to go too far into the medina to see beautiful cookware, copper pots, scarves and jewelry, all made by hand, and often on site. Although some of this no doubt is for the benefit of the tourists, there seemed to be a ratio of about 8 locals to every 1 tourist. Satisfied by our quick penetration of the medina, we headed back to the riad to meet our guide. Her name was Milouda, and she made fun of me for wearing my makeshift hijab. We started off our tour by walking down the medina's food market. The offerings were as "exotic" as any American could hope for: bags full of living snails, thin oily bread cooked on dome shaped hot metal, bundles of fresh herbs and piles of spices, and so on. I was impressed by the rich variety of the offerings. Like any good millennial, I looked up information about Fes online before the trip and saw all of the traveler's photos posted on TripAdvisor. I realized we must be on the tourist circuit when Milouda stopped by a butcher's shop and tried to get us to take a picture with a severed camel's head. Severed camel heads are even grosser in person than they are on TripAdvisor, fyi. After that we went to Medersa Bou Inania, one of the best tourist sites in the whole of Morocco, according to Rough Guides. It is hard for me to explain just how cool this site is. A medersa (or "madrasa") is a building which houses students and is designed to create a space for study and contemplation. We could look up from the courtyard and see the windows to the student's cells. And apparently this medersa is where they used to send underperforming students before they were about to get kicked out of school! Certainly a perk to being a bad student, being able to live in such beautiful digs. Milouda showing us the difference between written arabic and the calligraphy-style arabic used on the walls. The medersa also evidenced the robust trade between Morocco and other parts of the world back in the 1300s. Milouda told us, "We gave the Italians sugar for their marble. They ate the sugar, we still have the marble". Important lessons here, kiddies. There were lots of gorgeous instruments, bellows, cribs, tools...all made from wood. Again, the craftsmanship was very impressive. One of the best parts of the tour was visiting the local co-ops specializing in various artisan goods. We visited a weaver's co-op that made scarves on looms, a rug co-op that made handwoven "classical" and "berber" rugs, and a leather co-op that over looked the famous Fez tanneries. View down into the tanneries. Pits of various chemicals for leather processing. Skins hanging on the right. The ones on top are Berber rugs. The dunes represent the sand dunes in the desert. As was noted on trip advisor, they do expect you to buy things when you visit, so perhaps offer your guide an extra tip beforehand to avoid some of the high-pressure sales tactics (we forgot to do this). That being said, it was still a great experience, and we learned a great deal about the fabrication of each product. We had Milouda drop us off at Café Clock, and it was all that was promised, and more! Super lively vibe, a group of berber women played traditional music on hand instruments downstairs. Great mix of people, from young "hip" moroccans, to various students and tourists from around the globe. There was even a mini-movie theatre on the second floor. The food was also good and super reasonably priced. Two thumbs up. The next day we had to hop on the train in the early afternoon, but we decided to take a quick trip via taxi up to the Merenid Tombs. The hilltop ruins offered a great view of the city below. It was a great way to end our stay in Fes. The Fes train station. Next stop...Marrakesh! And there you have it. I have more videos and photos on my Insta (lazeez90). Marrakesh post coming soon!